Clinical studies of children with autism spectrum disorder (ASD) provide evidence for poorer neuropsychological performance within specific domains compared to age, gender, and sometimes IQ-matched controls. Since recent evidence suggests that autistic symptoms form a spectrum that extends into the general population, it was our goal to evaluate the nature of the relationship between autistic traits and neuropsychological performance across the continuum in the general population. We examined neuropsychological performance across five different domains in 1019 6-to-10-year-old children participating in a population-based study of child development. Autistic traits were assessed when the children were 6 years of age using the Social Responsiveness Scale and ASD diagnoses were obtained via medical records. Neuropsychological functioning was measured using the NEPSY-II-NL and included the domains of attention and executive function, memory and learning, sensorimotor functioning, language, and visuospatial functioning. We found that children with higher autistic traits showed significantly lower neuropsychological performance in all domains investigated and that this association remained even after excluding children with the highest autistic traits or confirmed ASD. When comparing 41 children with confirmed ASD diagnosis to typically developing controls, children with ASD showed significantly lower neuropsychological performance across all domains. 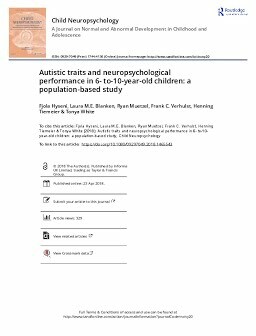 Taken together, our results suggest that children with both ASD and subclinical autistic traits have lower neuropsychological performance. Thus, this may provide an understanding of why some children without an ASD diagnosis may require some additional assistance within academic settings.